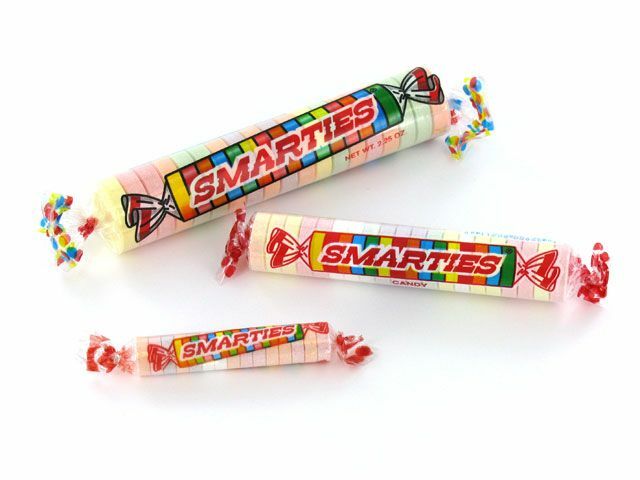 Smarties were a popular penny candy when I was growing up. You could get a roll for a penny at dimestores like Woolworths or Ben Franklin. They are little sweet wafers wrapped in a clear cellophane package. I always preferred them to SweetTarts, which have a taste that is more tart. Smarties were invented in 1949 by Edward "Eddie" Dee for his company, Ce De Candy, in New Jersey. The candies are called Rockets in Canada. These candies are currently produced in Union, New Jersey, and Newmarket, Ontario. They come in six colors (and flavors): white (orange-cream), yellow (pineapple), pink (cherry), green (strawberry), purple (grape), and orange (orange). This childhood favorite is completely vegan (see link from the Smarties website). Plus, they are fun for Halloween -- or other times of year as well! Do you remember this retro candy from your childhood? Was it a favorite? BB bats...they are like taffy on a stick!!! They weren't penny candy when I was young but they were one of my favorites. But my all time favorite retro candies are Mallow Cups and SkyBars... yummmmm!! They are so hard to find but I do it feels like I hit the jackpot! Holy moly this is a blast from the past! And VEGAN! HA! Great "Did you know" Share!